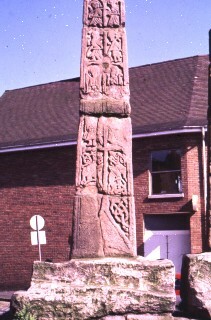 This shows the west face of the cross shaft apart from the top. The middle of the cross shaft, top shown here, has three rows of panels. The first two are identified as a Calvary scene. Christ is carrying the cross in the upper left panel. The figure in the bottom right of these four also carrying a cross is thought to be Simon of Cyrene. The other two figures are probably two soldiers, or they could be the two thieves. The bottom row is an Annunciation scene, New Testament, Luke 1:26. The lower part of the cross has two figural panels together. Below this there are two beasts. On the base there is the remains of one panel of interlace.